Pac-Attack (パックアタック, Pac-Attack?) is a puzzle game in the vein of Columns and Dr. Mario. It was adapted from Cosmo Gang the Puzzle, an arcade game released in the previous year. 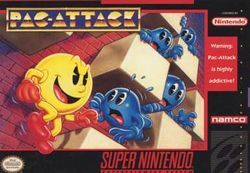 Released by Namco, it features Pac-Man as the main playing pieces, with the Ghosts and blocks as obstacles. The game was initially published in 1993 for the Sega Genesis and SNES. Game Gear and Game Boy versions followed in 1994. The Game Boy and Game Boy Color releases also feature a Super Game Boy enhanced color palette. Although Cosmo Gang the Puzzle was released to the arcades, there was never an arcade version of Pac-Attack. The game was released as Pac-Panic in Europe. On a Tetris-like board the player drops blocks consisting of Ghosts, Blocks, Pac-Man, and one Fairy (if your Fairy Meter is full) to the ground. The objective is to prevent the blocks from stacking up to the top of the board. Rows are removed from the board whenever they are entirely filled with blocks. When Pac-Man arrives, he eats ghosts in whichever direction he is facing. As he eats ghosts, the Fairy Meter goes up. Once full, a fairy will eventually appear. When the fairy lands, she waves her wand and every ghost in the eight rows below will disappear, often resulting in numerous lines being completed and simplifying the board. It has been re-released on various Namco anthologies such as the Game Boy Color's Pac-Man: Special Color Edition, Namco Anthology 2, Pac-Man Collection, Pac-Man World 2, the PS2/Xbox/GameCube version of Namco Museum and the downloadable version of Pac-Man Museum. The SNES version was re-released on the Wii's Virtual Console download service in North America on January 14, 2008, with a European release following on June 27, 2008. This page was last edited on 25 June 2015, at 23:50.